If you were given a choice between two different doctors–one that is trained and one that is not–which one would you choose? That’s an easy answer, right? Then why is it that many small business owners and business executives don’t recognize the importance of properly training their employees? There is a myth among small businesses and business executives that the cost of training employees isn’t worth it. So, they rely exclusively on on-the-job training and outdated employee handbooks or other policies and procedures to teach their employees how to do their jobs. But the truth is, having an employee training program means your workers are consistently learning new or refining skills that improve productivity, reduce mistakes, build confidence, and create a better work environment. An investment in your employees’ skill sets is an investment in your company and supports the truth that when employees get better, quality gets better, the company gets better, profits get better, customers get better, and recruitment gets better. Moreover, having dedicated training programs in place makes employees feel good about the work they do and feel valued by the company they work for. The lack of proper training and an underdeveloped sense of value can contribute to low employee morale and, ultimately, to employees looking for work elsewhere. Here are ten reasons you should have an employee training program in place. Employees who feel inadequate, unsupported, or unqualified are unhappy. They are not satisfied in their work, which will cause them to underperform, make mistakes, and not care about their work performance. Unhappy employees cost businesses valuable time and money. Most employees will have some weaknesses in their workplace skills, and a training program allows you to strengthen the areas the employee needs to improve. A training program brings all employees to a similar level of skills and knowledge and will expose weak links within the company who rely on others to pick up their slack. Providing a consistent training program creates a cohesive team of employees who can take over for one another as needed, without constant help and supervision from managers. The productivity of untrained employees is lower than properly trained employees. Employees who have not been fully trained cannot be held accountable for information they haven’t been taught, leaving room for mistakes, insubordination, and poor performance. Employee productivity will increase when a training program is implemented and managed properly. Increased efficiency in procedures ensures the quality of work, competency, and employee confidence, that will improve the business and its profits. A well-designed training program ensures that employees will be consistent with the company’s policies and everyone will be aware of the expectations and procedures within the company. Accountability to policies and procedures brings a feeling of fairness to the workplace and employees’ performance will increase when policies are upheld. Increased employee performance equals increased profits for the company. When employees are not properly trained to perform their tasks and responsibilities, it takes them longer to do the work, costing the company time, money, and effort. Workplace morale is affected when you have poorly trained employees who are self-starters working with employees who are not. Team cohesion is an asset to the company, whereas team division is a liability. When an untrained worker makes a mistake, the time and materials used are lost, and the work still has to be redone. For example, creating a document incorrectly means reprinting the file, more time to fix the mistake, more materials cost in paper and ink, and more time rechecking the work. If it were done correctly the first time, no costs would be lost. Training can be help reduce the impact of employee mistakes. All businesses are subject to legal and regulatory requirements. Violating these laws or regulations can cost businesses significant time and money, and in extreme cases, force them out of business. Businesses that train their employees in legal and regulatory compliance are much less likely to run afoul of the law and are, thus, much less likely to experience the negative financial impact of unnecessary violations. 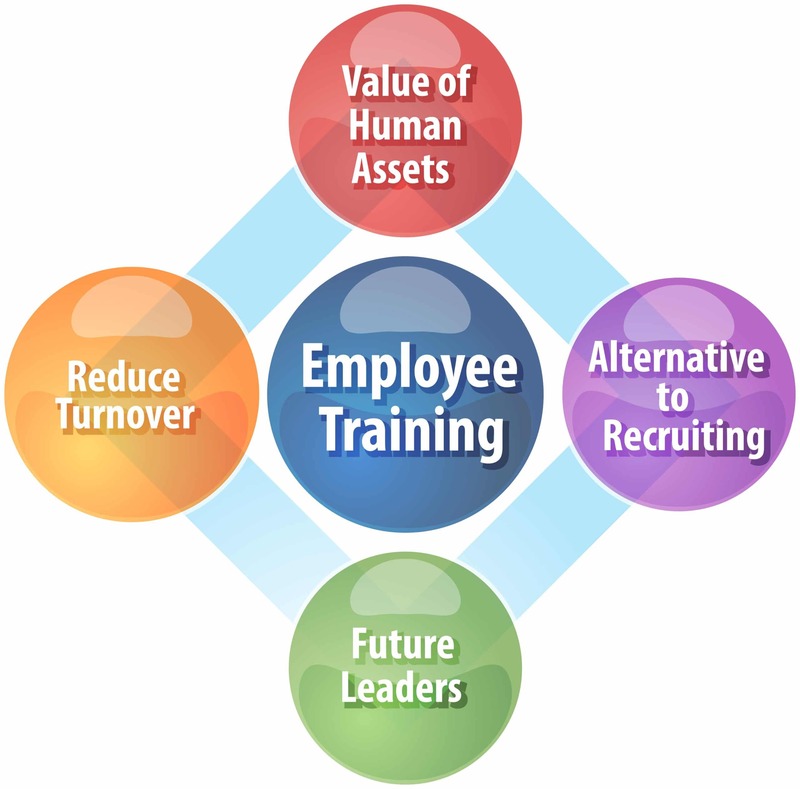 Employees view training and development as an additional company benefit. Employees are more likely to feel valued if they feel like you have invested in them and are less likely to look for another job, cutting down on recruitment costs due to staff retention. Untrained employees can cause many of the mistakes listed above, and those mistakes and inefficiencies can cause your business to lose customers. That is the worst possible scenario, but it can happen. Having a strong and successful training program helps to develop your brand as an employer, making your company a target for top talent who seek out opportunities to use their skills and learn new ones. Ongoing training and development of satisfied and inspired employees generate creativity and new ideas that can take your business to a new level. Employee training programs may seem to cost money and wasted time that can walk out the door if the employee decides to quit. However, the added costs of having poorly trained staff shows the importance of having a well-designed, efficient and updated training program for your employees. Developing and implementing a continuous, effective, and inspiring training program will increase your employees’ satisfaction, production, performance and ultimately your company’s profits. Rebecca is the owner of the Office Alchemist, an outsourced and evolved talent management and human resources for small businesses in California. Her uniquely designed system has infused HR with employee-life coaching, micro-learning training and an innovated method of employee development, adding the personal growth, accountability, and career development that the millennial generation is asking for and that all generations can benefit from. Rebecca has a Bachelors in Interpersonal Communications and journalism, a Human Resource Management certification from The University of the Pacific, and has been a certified Life Coach for 12 years. She lives in Fortuna, California, and is dedicated to helping small businesses in Humboldt County to thrive financially and consciously while creating a workplace that helps employees thrive too.